MANILA, Philippines - President Benigno 'PNoy' S. Aquino III will deliver on Monday, July 27, 2014 his 6th and Final State of the Nation Address (SONA) before the third regular session of the Sixteenth Congress at the Batasan Pambansa in Quezon City. The final SONA of the President is expected to highlight the accomplishments of the administration, results of his promises during SONA 2014 and plans in his final year in office under his "Daang Matuwid," or the straight or righteous path campaign. According to Communications Secretary Herminio Coloma Jr., PNoy will emulate her mother Cory Aquino who looked back at history during her final SONA in July 22, 1991. "Iyong mga pagpili ng salita, ang tinitignan na rin mismo ng Pangulo ay iyong kasaysayan. Hindi na ito ordinaryong talumpati lamang, tinitingnan na rin niya kung paano mailalagay o mailalatag sa kasaysayan ng bansa iyong kaniyang panunungkulan bilang Pangulo mula 2010 hanggang 2016," Coloma said. Malacanang said that Filipinos will learn a lot from PNoy's highly anticipated speech. SONA 2015 will serve also as guide for the Filipinos in facing the future of the country. Coloma cited that the President remains committed to promoting inclusive growth to make every Filipino achieve his dream. The administration's allies and critics are expecting the President to end speculations by declaring the administration's candidates for the two highest positions in the country for next year's elections. Aquino is expected also to provide updates on the passage of Bangsamoro Basic Law (BBL). Coloma said the Malacanang is setting a new target for the BBL to be enacted when Congress reconvenes after the SONA. 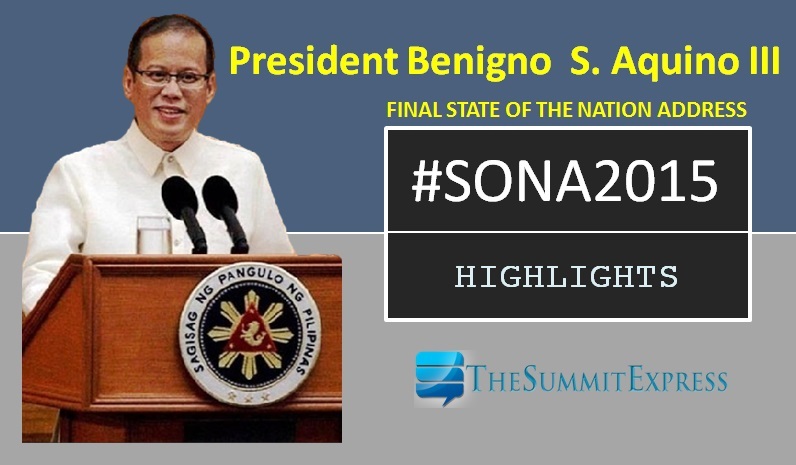 SONA 2015 in general highlights different aspects of the nation - economy, jobs, asset reform, education, sports, government and ethics, health and environment, tourism, justice, urban poor, issues in Mindanao, foreign affairs and national security. Aquino's speech report last year was the most emotional SONA so far but the Palace said it should not be construed as a sign of weakness of the president.